Luxuriously Comfortable, Dramatically Glamorous Pure Colour In A Velvety Soft Lipstick. Creamy Matte Colour Coats Lips In An Even, Lightweight, Satin-soft Film. The Handy Twist-up Retractable Stick Means Goodbye Sharpener. Perfectly Sized To Fit Into A Handbag Or Purse, And Ideal For Packing Into A Carry-on Bag When Travelling. Explore the entire range of Lipstick available on Nykaa. 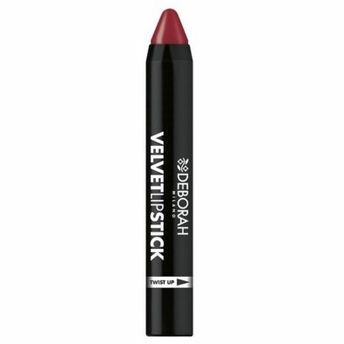 Shop more Deborah products here.You can browse through the complete world of Deborah Lipstick .Alternatively, you can also find many more products from the Deborah Velvet Lipstick range.